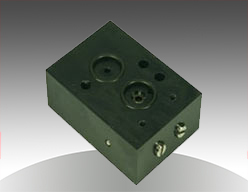 The NF1 is a unidirectional needle valve used to adjust closing or opening speed. Only one direction of rotation can be adjusted. It can be used with DOUBLE ACTING or SPRING RETURN actuators. The NF2 is a double unidirectional needle valve for DOUBLE ACTING actuators. It is used to adjust the closing and opening speeds. The NF3 is a double unidirectional needle valve for SPRING RETURN actuators. It is used to adjust the closing and opening speeds.